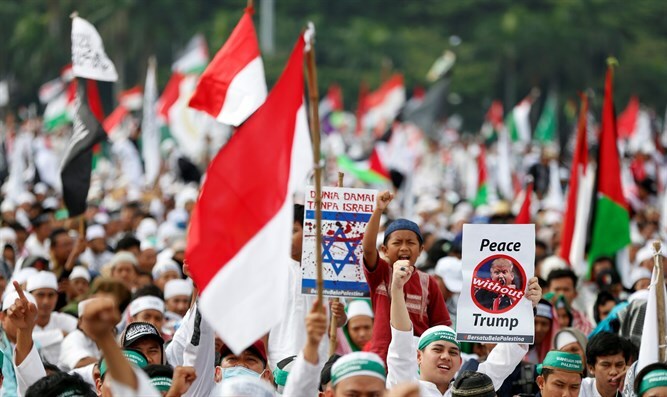 Tens of thousands of Indonesians protested Sunday against the US decision to recognize Jerusalem as Israel's capital, the latest such spectacle in the world's most populous Muslim country. The rally was organized by the top Islamic authority in the country, the Indonesian Ulema Council, and supported by the government as well as several other Islamic organizations. Police said 80,000 protesters gathered at the National Monument, a tower that looms over central Jakarta, waving the Palestine flag and banners reading "Free Palestine" as they shouted "Allah is greater!" One of the banners read: "DUNIA DAMAI TANPA ISRAEL" which means "A peaceful world without Israel." "This is my solidarity as a Muslim to my fellow Muslim brothers and sisters in Palestine... the Al-Aqsa mosque, a historical mosque for Muslims, is there (in Jerusalem)," said Hermawati, from the nearby city of Bogor, who like many Indonesians goes by one name. Dressed mostly in white, the demonstrators demanded that the US change its decision. Indonesia's religious affairs minister and Jakarta's governor were among those at the protest site just a few meters from the US embassy, which was cordoned off behind coils of barbed wire. "Isn't it the government's job to work on the aspiration of the majority of Indonesians? And the government has tried its best so Palestine can achieve its rights and independence," Religious Affairs Minister Lukman Hakim Saifuddin told the crowd. Indonesia has condemned President Donald Trump's decision, with President Joko Widodo joining other world Islamic leaders last Wednesday in an emergency summit of the Organization of Islamic Cooperation in Istanbul. The leaders urged world powers to recognize eastern Jerusalem as the capital of the "State of Palestine" and declared Trump's decision "legally null and void." The UN Security Council is considering a draft resolution which would find that any change to the status of Jerusalem has no legal effect and must be reversed.